Ransomware attacks targeting your data are increasing in number. They’re becoming more sophisticated, and they’re also now zeroing in on your backup infrastructure. 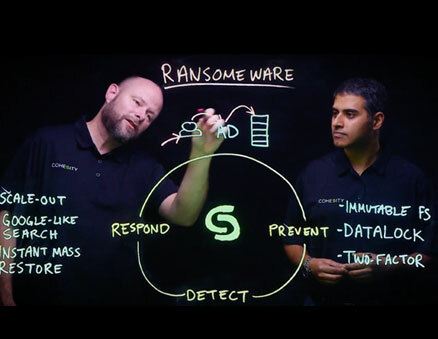 Cohesity counters ransomware attacks with an end-to-end solution that prevents your backup from becoming a target, detects a potential attack, and if the worst happens, responds by taking corrective action. Is your existing backup immune to a ransomware attack? It's time to demand more from your backup. Download this eBook for best practices on preventing, detecting, and responding to a ransomware attack targeting your backups. 5 considerations to keep in mind when you’re strategizing how best to prevent, detect, and rapidly respond to a ransomware attack on your backups. Trust Cohesity’s comprehensive solution to defend your data against ransomware attacks. Gain unique, multi-layered protection against a ransomware attack. Provides unlimited read - only state snapshots, that are stored with extremely low overhead. Cohesity writes snapshots into internal views that are never exposed, making them inaccessible to processes and software. Leverage WORM-like capabilities for your backup that let the security officer role create a time-bound protection to the snapshot that even your administrator or security officer role can’t overrule. Stop criminal actors that manage to get access to your system password from accessing the Cohesity backup without passing an additional layer of security in the form of multi-factor authentication. Simplify intruder detection with a global enterprise SaaS-based management solution. Cohesity Helios empowers your IT staff with machine-driven intelligence to detect and report any anomalies. Take advantage of Helios cutting-edge machine learning algorithms to proactively assess IT needs to ensure business continuity. Know when your data change rate is out of the normal range—based on daily change rates on logical, stored, or historical data ingest. Stay informed of any suspicious behaviors with automated notifications-using Cohesity Helios. Search and recover your ransomed enterprise data and applications back—at scale. Use Cohesity’s scalable file system, SpanFS, to store backup data at the retention rates you set—close to production for fast recovery. Search and locate infected files and data, globally, and take corrective action fast, right there. Instantly restore hundreds of VMs to any point in time with Cohesity’s patented SnapTree® and fully hydrated snaps. Ransomware is one of the greatest enterprise threats right now and as it becomes more targeted and sophisticated, organizations have realized that a reactive approach is insufficient. Instead, they need a mitigation strategy that focuses on holistic prevention with rapid detection and response. Cohesity is not just the only solution that provides the necessary tools for this, they also provide mass restoration from immutable backups that gives me confidence that if/when we face a ransomware attack, we will be able to avoid any downtime or disruption to our business. Ransomware remains one of the most insidious threats to business information today, and the results can be devastating” said Steven Hill, Senior Analyst of Applied Infrastructure and Storage Technologies at 451 Research. “Even if the financial demands are met, there’s no reason to trust that the criminals behind a ransomware attack will actually restore your data. The best approach to managing ransomware protection lies in a strategy that combines early detection with rapid response capabilities, backups that occur often enough to minimize impact, and the ability to insure that malicious payloads aren’t restored along with good data. Looking to Counter Ransomware Attacks?